Talk about savory! Talk about healthy! Talk about delicious! And all in one dish! 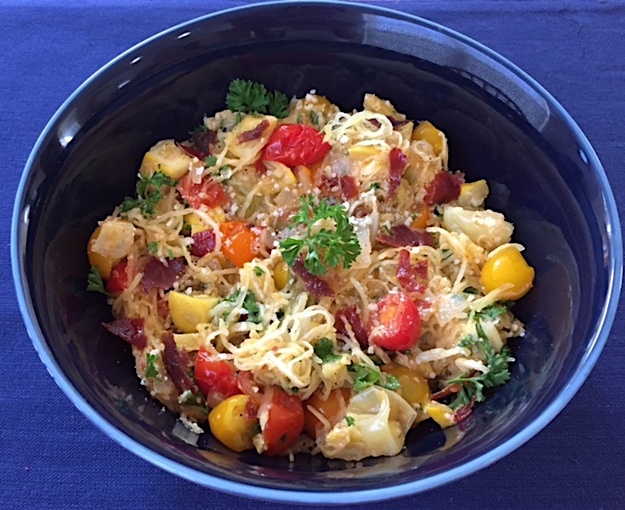 Pierce the spaghetti squash with a knife or fork several times and place in the microwave. Cook for 5 minutes. Remove and let cool slightly. Cut spaghetti squash length-wise and, using a fork, scrape out the seeds and spaghetti. Discard seeds, and set spaghetti portion aside. Heat 1 tablespoon olive oil in a skillet over medium-high heat. Add prosciutto and cook until crisp. Remove, crumble, and set aside. Add remaining 1 tablespoon olive oil to skillet along with onion and garlic. Cook for 2 minutes. Add summer squash and cook for another minute. Add tomatoes, salt, pepper, and vinegar. Cook for 2 minutes. Remove skillet from heat and add spaghetti squash, parsley, and parmesan. Divide into bowls and top with chopped prosciutto. Enjoy! If you'd like a printer-friendly version of this recipe, Click Here. This delicate, yet spicy broth adds a unique flavor that is enhanced with each succulent spoonful of fresh lobster meat. Heat oil in a medium sauce pan over medium heat. Add red pepper, garlic, and ginger. Cook for 2 minutes. Add lemon (rind on), vegetable stock, 1 1/2 tablespoons of honey, rice wine vinegar, 1 tablespoon soy sauce, and pepper. 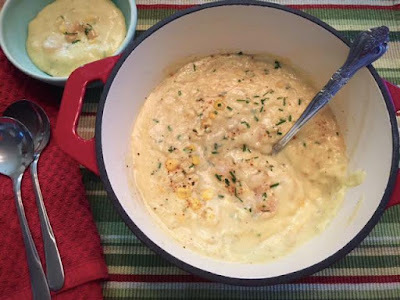 Bring to a simmer, cover, and cook for 15 minutes. Place the lobster tails in the sauce pan, cover, and cook for 4 minutes or until lobster reaches 145 degrees with a meat thermometer. Remove tails and let cool slightly. Split tails lengthwise and remove meat from shells. Discard shells. Slice the lobster meat into bite-sized pieces. Pour cooking liquid through a sieve into another sauce pan. Discard solids and keep the broth warm over low heat. Add remaining 1 teaspoon of honey, grated lime rind, lime juice, shallots, and remaining 1 tablespoon soy sauce. Stir until combined. 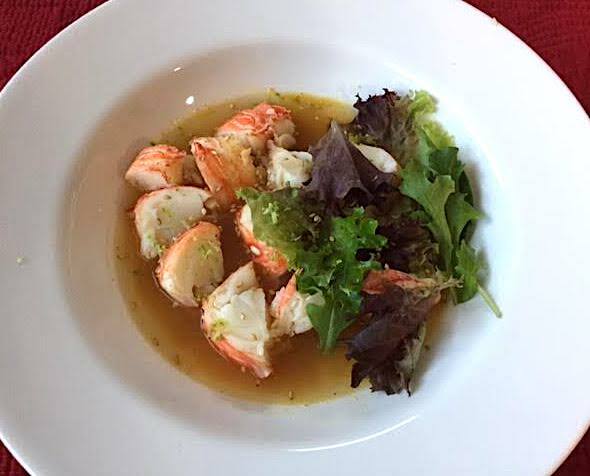 Place about 1/3 cup of broth in a bowl and arrange lobster meat on top. Garnish with pea shoots or mixed lettuce. Sprinkle with sesame seeds. Enjoy! If you'd like a printer-friendly version of this recipe, Click Here. "Do the right thing, even when no-one is looking. If you love pumpkin and cheesecake both, this is your lucky day! Well, I guess a truly lucky day would be to receive them in the mail from me. :) A wonderful dessert for Thanksgiving or any lovely fall day! Preheat oven to 350 degrees. Line 2 pie pans with crust. Bake for 10 minutes and let cool. In a large mixing bowl, combine the cream cheese, eggs, sour cream, and sugar. Then add the rest of the ingredients. Divide batter evenly among the 2 pie pans. 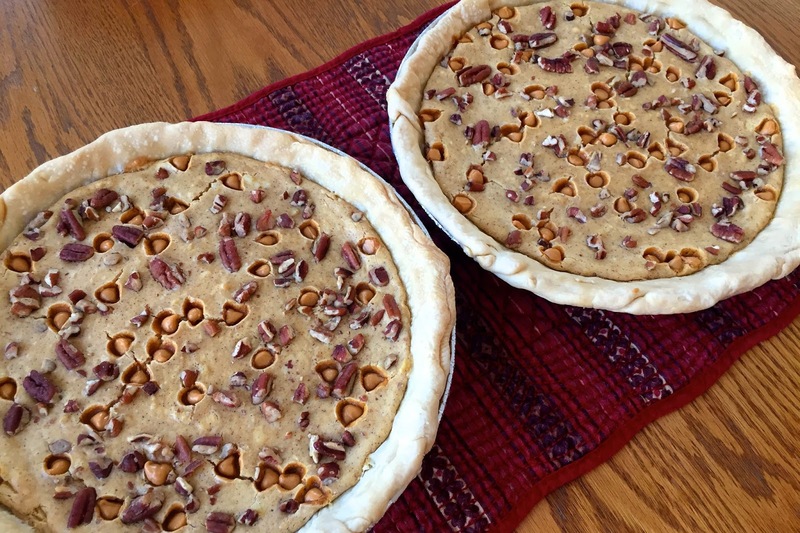 Top with pecans, if desired. 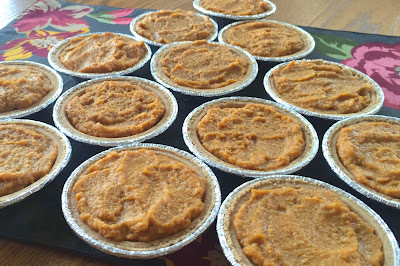 Before baking, rim the edges of the pies with aluminum foil so crust does not burn. Bake for 30 minutes. After 30 minutes, shut off the oven but leave the pies in for another 30 minutes. Let cool and refrigerate. Enjoy! If you'd like a printer-friendly version of this recipe, Click Here. "Let us give thanks for the blessings we receive. Bone broth is one of the world's best sources of natural collagen. Protecting joints, strengthening the gut lining, maintaining healthy skin, hair, and nails, and supporting immune system function are just some examples of what collagen does for you. A lot of people, including my husband at one time, take glucosamine for pain and arthritis in joints. By drinking one cup of bone broth a day gives you more collagen than the supplements and it also includes other great minerals that glucosamine does not have. Taking glucosamine supplements to help with joint pain has been common knowledge for years, but it turns out that bone broth has glucosamine too. NOTE: Most recipes include roughly chopped carrots, celery, and herbs to their stock. I incorporate all of that after my stock is done and I'm ready to make a good soup, because when your stock is done you need to strain it to remove all the bones. I find there are so many little cooked-down bones that it's too time consuming to remove the carrots and celery alone. For me, the garlic and onion with the bones still provides a fantastic taste. Add the bones, onions, garlic, and pepper to a large dutch oven or stock pot. Add enough water to cover and bring this to a roaring boil. Let boil for 10 or so minutes and turn down to simmer. Simmer for 3 hours. (The longer you simmer, the more collagen is extracted from the bones. That's why a lot of recipes say to put all ingredients in a crock pot and let simmer overnight.) You may need to add water as it begins to evaporate. The bones provide such good flavor, it shouldn't taste watered down. You can always add seasonings when you make your soup or drink your bone broth. After 3 hours, strain the broth to remove all of the bones, onion, and garlic. It is good to cool this down quickly as the hot broth breeds bad bacteria. You can add 2 cups of ice to help cool down quickly. Once it's cool, you can freeze it up to a year or place it in the refrigerator for about 5 days. When you remove the broth from the fridge, you will notice a layer of fat that has risen to the top. You can heat this back up and drink it, or if you're like me and don't need the added fat, ladle it out before heating up the broth. Your broth should be jiggly and gelatinous. If it is not, you might not have used enough bones or simmered it long enough to extract the gelatin. Once you're ready to make your soup, just heat the broth up with your favorite ingredients. I have used carrots, celery, onion, broccoli, cauliflower, edamame, and chicken. Makes for one healthy pot of soup! 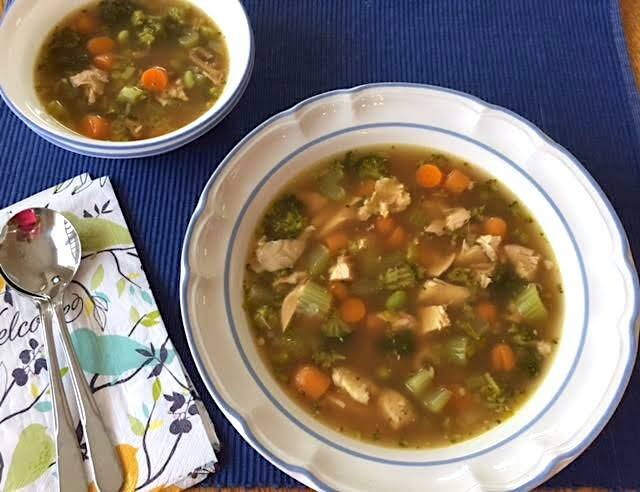 If you would like this bone broth recipe in a printer-friendly version. Click Here. Preheat oven to 350 degrees. Combine all ingredients except egg and milk. Remove 1/2 cup of crumb topping and set aside. 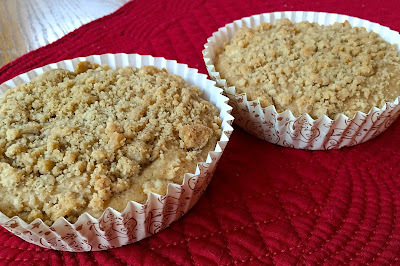 Add egg and milk to remaining crumbs and pour into baking cups, a greased muffin tin, or a greased 8-inch pan. Sprinkle with reserved crumb topping. Bake for 20 to 25 minutes. Baking times may vary. Check before 25 minutes to see if they're done. Don't over bake. Just enjoy! :) If you'd like a printer-friendly version of this recipe, Click Here. "Leaves falling, lots of laughter, and a cup of coffee. Only recently have I started cooking with leeks. Freshly diced in my salads, sautéed with other healthy vegetables, and in soups such as this one. So creamy and incredibly flavorsome. What's even better is it's very easy to make! In a large sauce pan or dutch oven, add all of the ingredients down to and including a little salt and pepper (to taste). Boil until potatoes are soft, about 15 minutes. Remove bay leaf. Let set 5 minutes to cool slightly. Using an immersion blender, blender, or food processor, add half of the soup mixture and blend until it's smooth. (Release the lid slightly when blending hot liquids so the steam can escape. Hold a towel over the top.) After blended, add the remaining soup mixture and blend until smooth. Transfer to a medium sauce pan, add heavy cream and let simmer 5 to 10 minutes to thicken slightly. 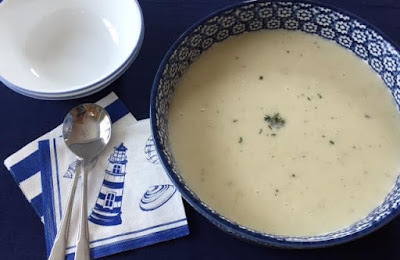 Remove to soup bowls, garnish with chives or thyme and Enjoy! If you'd like a printer-friendly version of this recipe, Click Here. 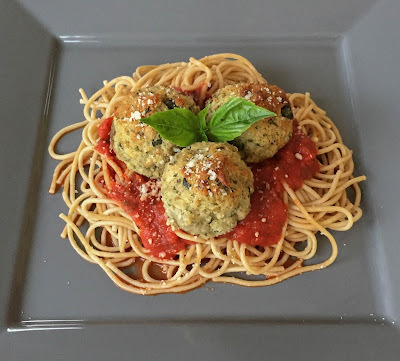 I had eggplant meatballs at a restaurant recently and couldn't believe how fabulous they tasted. What a healthy way to enjoy one of our favorites dishes, spaghetti and meatballs! Preheat oven to 375 degrees. Line a baking sheet with aluminum foil and place eggplant on top. Use a fork or a knife to prick eggplant about 4 to 6 times. Place eggplant in oven for 30 minutes. Remove and cool for about 20 minutes. Leave the oven on. Slice eggplant in half lengthwise and scoop out the flesh, removing as many seeds as possible. Discard flesh. Chop the eggplant into very small pieces and place in a medium bowl. Add the rest of the ingredients, down to and including Panko. Combine ingredients. Line a baking sheet or baking dish with foil and spray cooking spray on foil. Roll eggplant mixture into balls (about the size of a golf-ball) and place them on the baking sheet or dish. Lightly mist them with the olive oil or baking spray and put them in the oven, baking them for 20 minutes or until they are golden brown and a bit firm. Remove, and enjoy with your favorite spaghetti sauce. If you'd like a printer-friendly version of this recipe, Click Here. Amazing dessert that is incredibly easy to make! A bite of this soft warm chocolate blondie will make you feel like you're in heaven! Sheer bliss! Preheat oven to 350 degrees. In a standing mixer, combine sugars, eggs, butter, and vanilla. In a separate, small bowl combine flour, baking powder, and salt. Slowly add the flour mixture to the batter and mix. Add the chips and combine. Pour in a greased and floured baking dish and bake for 20 to 25 minutes, or until toothpick comes out clean when inserted in the middle. Don't over bake. Let cook, cut into squares, pour yourself some coffee, and ENJOY! If you'd like a printer-friendly version of this recipe, Click Here.